Trophy in tow, the Vineyarders were greeted at ferry with fire trucks and cheering crowd. Self-discipline and calm under pressure paid off Saturday when the Vineyarders emerged victorious over Nantucket for the twelfth time in a row in the storied Island Cup rivalry. 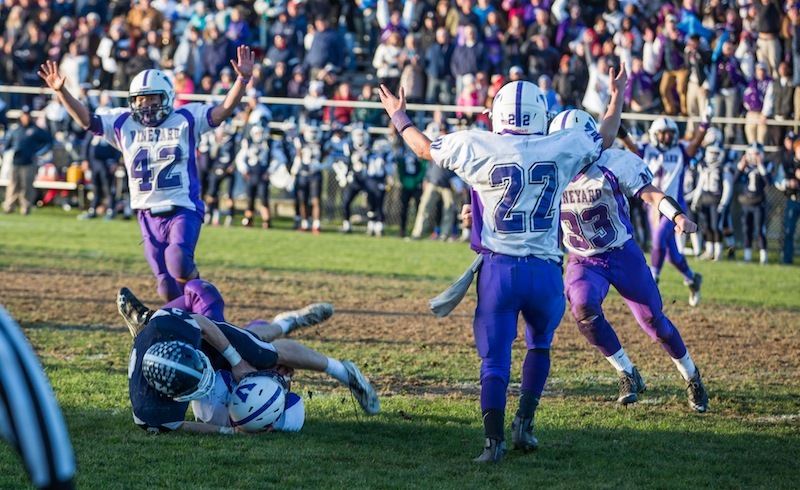 The 7-0 final score was decided early in the game by Vineyard running back Ben Clark’s touchdown and tight end James Sashin’s extra point. 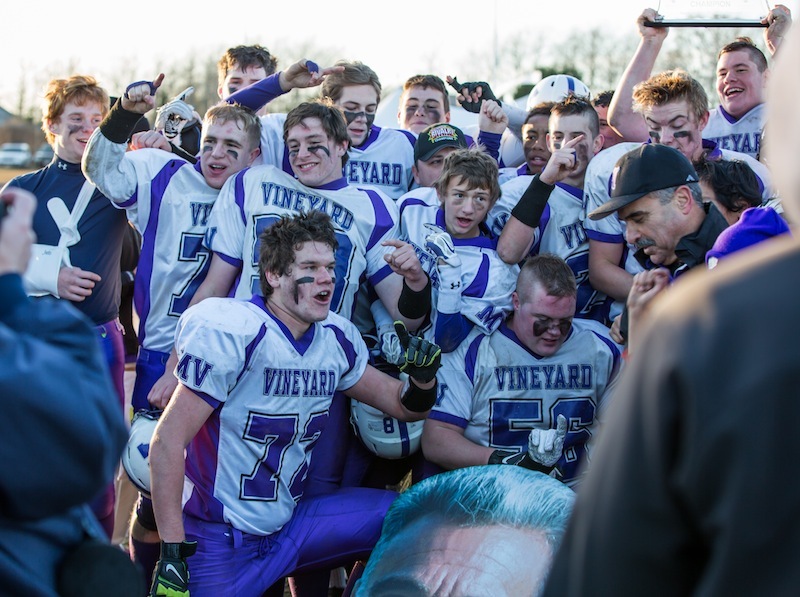 Despite strong drives by both teams throughout the game and a missed field goal attempt by the Vineyard, by late afternoon at the Vito Capizzo field on Nantucket, the shutout for the Vineyard was preserved. And Coach Donald Herman, who is retiring after 28 years, racked up one final win. Before the game the legendary Vineyard coach took the field with his wife Pam, daughters Yasmin and Gail and son Eric to receive a commendation from State Rep. Tim Madden for his accomplishments through the years. Those include an overall 220-90, and five state Super Bowl victories. Saturday’s game was his last. The long-running Island rivalry was evident from the start when the Whalers charged the field and planted three large flags — including a U.S. flag and a pirate flag — near the end zone where the Vinyarders were warming up. Coach Herman and his assistants rushed across the field and put themselves between the two teams to diffuse the situation. 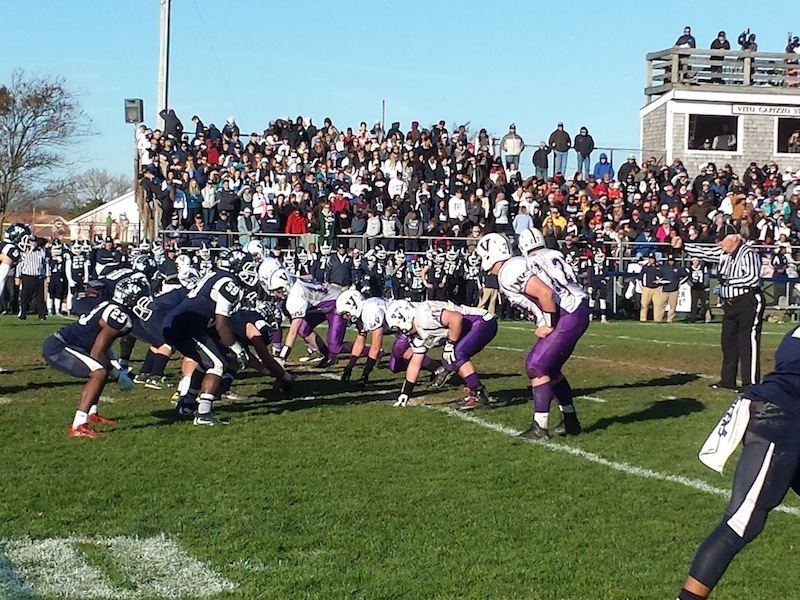 Then just after 1:30 p.m. the Whalers won the coin toss and kicked off under a clear blue sky. A large U.S. flag hoisted on the ladder of a Nantucket fire engine snapped in a steady northeast wind. The bleachers at the high school field were filled near to capacity. Ben Clark was the standout of the day with his first quarter touchdown, taking advantage of Nantucket’s setback early in the quarter from a string of personal fouls. The Vineyard received only two penalties during the game. Vineyard running back Jacob Cardoza gained significant yardage during the game but was unable to score; one advance into the end zone was negated by a holding foul early in the fourth quarter. The Vineyard’s only field goal attempt came at the end of the second quarter but sailed just downwind of the left goal post. But each team put up a strong fight. Both teams pushed hard in the second half, eager to break the narrow lead. In the final quarter, the Vineyarders inched their way downfield to the 12-yard line, only to be pushed back to the 39-yard line on the other side. With 19 seconds left in the game, the Whalers had the ball, but Vineyarder Elijah Matthews intercepted a pass to regain possession. The Vineyarders were at the 15-yard line when the clock ran out and it was their team’s turn to rush the field. After congratulations, Coach Herman braced himself for the obligatory water-cooler dump and continued celebrating in the crisp November air. Some fans held enormous cardboard cutouts of his face which bobbed around on the field. After one final cheer, teammates and others lingered on the field to savor the win. 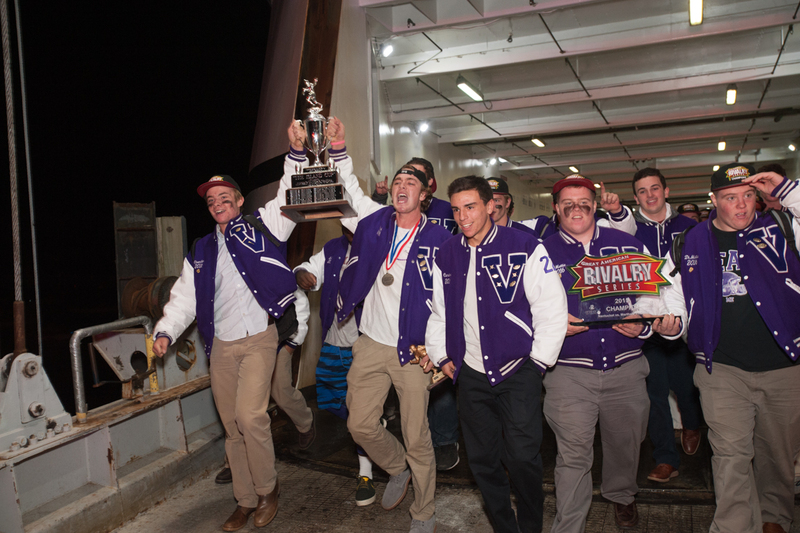 On the return ferry to the Vineyard, Coach Herman and the team were greeted by applause and cheering when they appeared on the passenger deck. With his family, students and friends, he enjoyed one last trip as head coach aboard the ferry. It was his 27th Island Cup. As the ferry approached Vineyard Haven, the vehicle deck filled with cheering and honking. Per tradition, a large crowd gathered at the dock to welcome the team home. 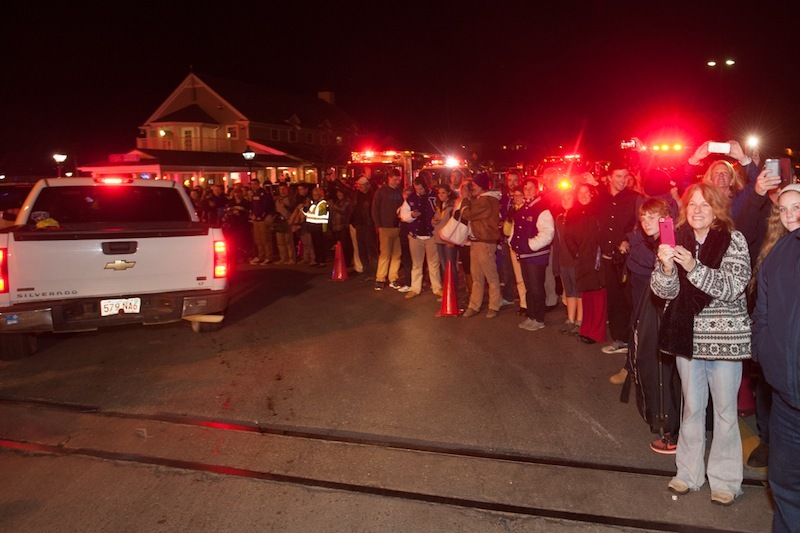 Fire trucks, rescue vehicles and police cars from around the Island blared sirens and flashed lights when the team emerged from the ferry in their purple varsity jackets, trophy held high. More photos from the Island Cup. We are the Vineyards mighty, mighty Vineyards! Everywhere we go people want to know who we are where we come from!